Vladivostok chain offers customers $125 store card with 3.5% interest. 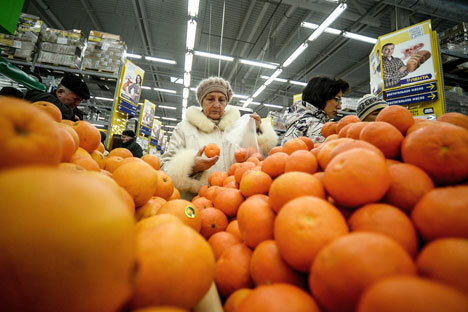 As Russians struggle to cope with falling incomes, Vladivostok retailer VL-Mart has decided to give its customers the opportunity to buy food on credit, the Vladivostok-based news agency PrimaMedia reported on Feb 12. The campaign, which according to the VL-Mart data, has already seen 80 people use this option to buy groceries on New Year's Eve, was launched in December 2015. The chain’s clients use this service mainly for buying expensive spirits and snacks, reported PrimaMedia. The initiative allows customers to acquire a shopping card worth up to 10,000 rubles ($125) for a period of three months with an interest rate of 3-5 percent. Microloans for VL-Mart customers are provided by VL-Finance, the network's subsidiary. The news caused a stir on social networks, where some users have compared the food credit cards with the food coupons in use in the Soviet Union during periods of food shortages.